The sculpture in the foreground of this picture is that of David Lloyd George. The figure almost seems as it is motion, and we certainly can’t argue the leader’s legacy is alive and well today steering the direction of the United Kingdom. October 2014, panorama from 3 vertical images, additional exposures for highlights, focal length 16mm, aperture f/11, exposure 6 seconds, ISO 100, tripod. A famous quote from George is “you can’t feed the hungry with statistics”. His attitude toward governing reflected that, and he created the foundation of the welfare state that provides a safety net for so many today. I wanted to capture the Clock Tower and Parliament Square to make this image unique, but also immediately recognizable. Not everyone out there, especially those who haven’t been to London, know about the line of sculptures which features great politicians including the likes of Winston Churchill and Nelson Mandela. 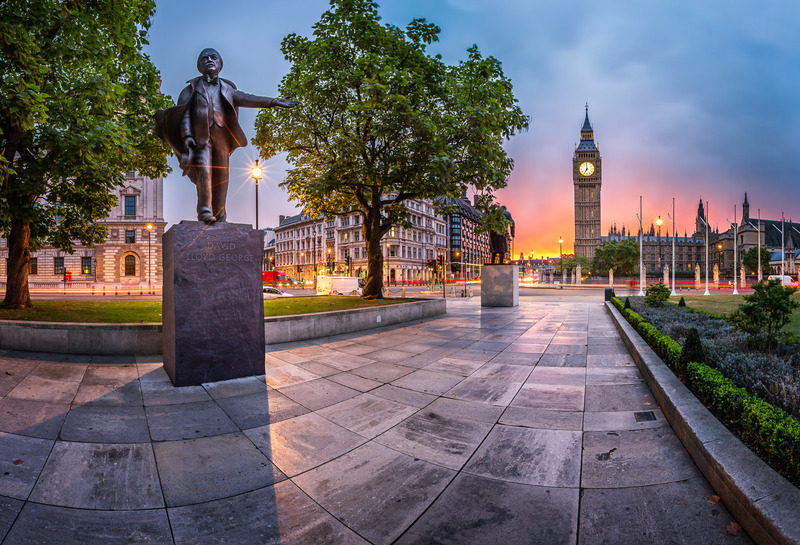 With a panoramic composition I was able to capture the foreground element of the George sculpture along with the background of the Clock Tower to show this statue in the context of famous London landmark. I found good location which naturally offered a strong composition. The prominent diagonal shadow leads the eye to the George statue help making it come alive in the picture. From the sculpture it also leads rightward to the famous Clock Tower. George’s hand seems as if it is pointing towards the Clock Tower and instantly recognisable Winston Churchill statue in background. This time the sky is cooperated with me! It created vibrant hues of sunrise around the Clock Tower and created strong mood of entire scene. I’m pretty happy with the result and I hope you will enjoy it too.